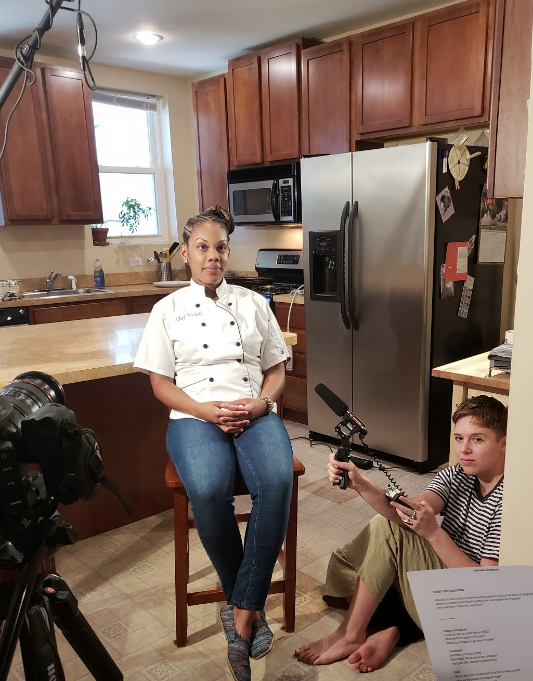 The Video Team cohort documenting Black Girls Cook, as part of their summer MediaWorks training. This blog entry was written by Kalaia Petteway. My experience with the video team thus far has been fun and challenging. The few weeks I have been working with the video team has been challenging, because I've had to use professional equipment for the first time. It was hard, but I've gotten used to handling and using the equipment and it has become easier. I've gotten an opportunity to get to know my mentors and fellow co-workers, and have made a lot of new friends, we’ve talked about different experiences. We’ve also talked about some of the things we have in common, like art, music, poetry, journalism, and love of a lot of different tv shows. When we are planning for a shoot, I'm in a room with other creative people and get the opportunity to bounce my ideas off theirs. When we get to the video shoot, we come together as a team, and that’s exactly what I imagined when I first became part of the program. I also imagined the set being busy with people running around, a lot of cameras, and the director telling everyone where to go and what to do, and it has been exactly like that. Before we get into work, we have a meditation session in the morning which is helpful, as it helps me prepare for the day and clear my mind. I hadn’t used meditation techniques before, but I will continue to use them. All the of the people that I work with make me feel comfortable because I can come to them if I need help or have a problem. Being a part of video team has helped me feel more prepared for a job and a career because I have now experienced what it feels like when someone gives direction, working with other people, and having responsibilities. I’ll be going into Game Design as a career but I'm grateful to have the opportunity to work and be a part of the film production team because it has given me skills that can help me in my career. Mr. Curtis and Mx. E testing out the sound booth in style at Wide Angle's offices. On set interviewing with audio gear, cameras and script ready.